WHAM! BAM! GLAM! 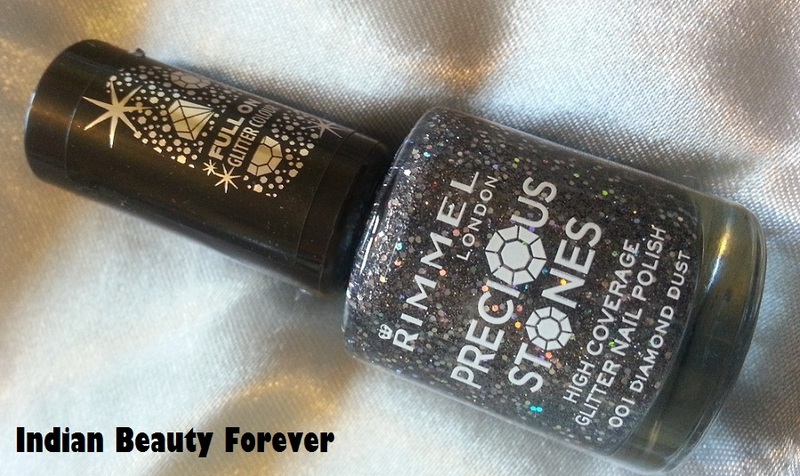 Are you ready for Rimmel's full on glitter colour? I was applying the shade yesterday and loved it so much that couldn't refrain from sharing a review with you all. 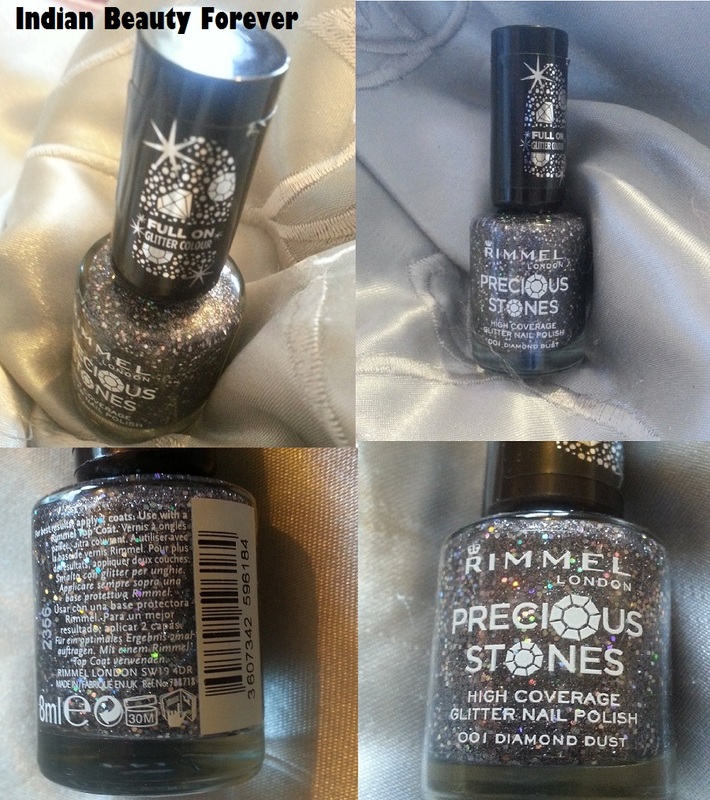 What Rimmel Claims- This is a high coverage beautiful glitter nail polish which is supercharged with gorgeous sparkles that can turn your nails into dazzling gems. They are available in 2 shades. My Thoughts: Precious Stones consists of two high coverage glitter nail polishes named Ruby Crush and Diamond Dust for glitter lovers, me included and went for Diamond dust. The glitters are jelly based; consist of silver glitters which are hexagonal. The polish is quite sheer; you can wear these on their own and looks really pretty on your nails. But to add more drama u can apply over other shade as well. It would suit all Indian skin tones and can be worn with both Indian and western attires. Description of shade: It is gunmetal grey with plenty of hexagonal glitters for sparkle. Applies evenly, dries very quickly and gives a matte effect, which looks gorgeous for those who like their glitters slightly more muted. As I like my glitters to really twinkle, so applied a top coat for shiny and sparkly finish. It’s an eye catching full on glitter colour. First coat will spread the glitters on all over the nails in one go. But two coats give best results. Staying power is also very good as it lasted the maximum three days after showering, washing, cooking and lots of household chores. It is a full on sparkle; you can apply on its own with larger silver bits scattered all over the nails or can apply on any other dark coloured nail polishes. It is really fabulous, adds more drama to nails and best for night outs. 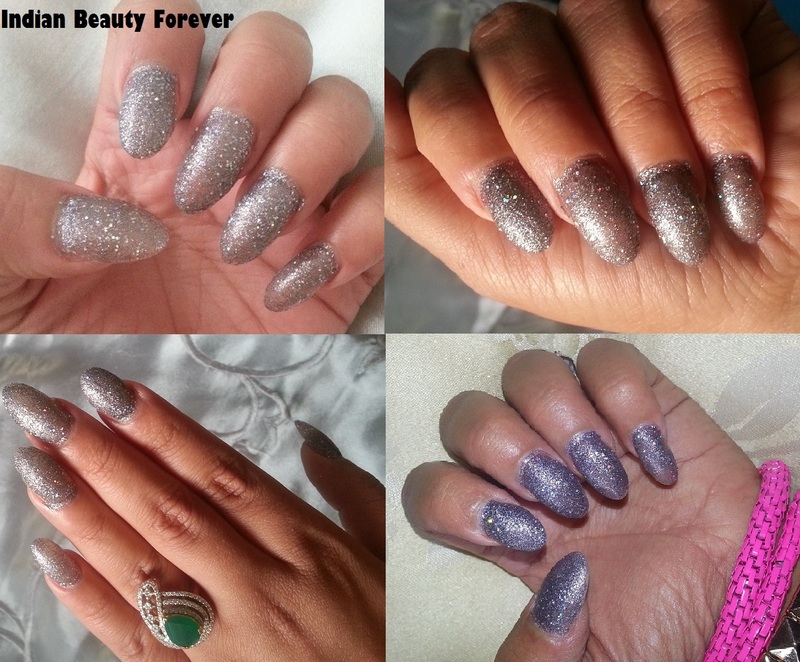 There are different type of glitters it - some of them are smaller, grey silver and multi coloured as well. The overall effect is absolutely stunning. Glitter nail polishes are normally a bit of a pain to remove but not this one; it can be removed nicely n easily with remover. Texture: Full of glitters and jelly like. I really adore the pigmentation of this nail polish as one coat will give full coverage and dry quickly too. Packaging: Sleek, classy, sturdy and travel friendly! The brand name Rimmel London is embossed on the lower part of the body with white colour. The colour name and number are also mentioned there. This product comes in a regular glass bottle with a black, plastic screw top lid. The brush is also average in size and picks up the precise amount of product to apply on the nails. 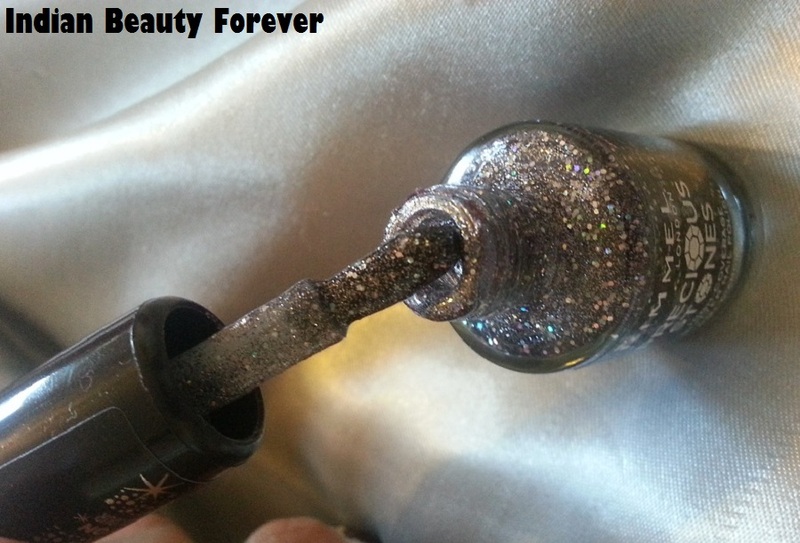 The product is all about the sparkle and even though can see the colour of the polish inside the bottle; the lid also states that it is full on glitter. Let's go for pros and cons !! thank you niesha..its really must have shade.. I loved it riti..indeed v grgs shade..
Wow Tej! I always find glitter nail polishes a bit gritty and get a strange feeling in my teeth when I touch them. But a glitter nailpolish with jelly finish sounds awesome. I will check it out online. aww...thanks sugandha ..how r u ?? Lovely glitter nails! :) Very pretty. Nice one. The bling bling look is great for functions. I love it so much. me tooo navneet <3 hi5 !!! I have a weakness for glitter nail paints and this looks awesumm..!! Nice color Tej, Love your ring. ha ha..nats totally my type sachi mein..
And, Your Arm Candies.. Love!! 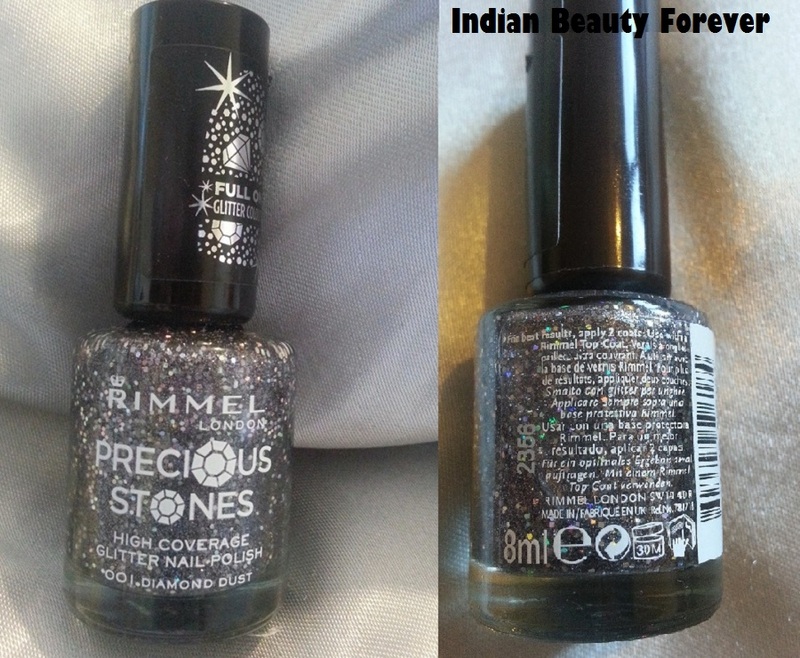 Thanks heena <3...I love glitter polishes too..but this one can be removed easily or nicely with remover..do give a try !!! It leaves a wonderful, dramatic look on your nails, xoxo. Bottles are so atrractive! It looks nice on ur nails Tejinder! very pretty ! loved it!